Pharaoh is a 5 reel 20 payline slot. There are hundreds of Ancient Egypt themed slots out there so it can be difficult for a developer to stand out. By the end of this article, you will have determined whether the Pharaoh slot by Inspired Gaming is worth a spin. If it wasn’t for the faint pyramids in the background and the light touch of artwork, this would be considered a plain slot. You can play the game on mobile and tablets and requires no download. Inspired Gaming Group is an e-gaming industry leading supplier with more than 50,000 gaming machines in over 30 countries around the world. It was formed in the UK in 2001 and has managed to employer over 10,000 employees. The company isn’t popular because they tend to focus more on creating land-based gambling solutions for bingo halls, betting shops, arcade rooms and casinos. There’s only a small number of their games online playable on mobile and desktop. Game symbols are picked from Egyptian culture. They include; a treasure chest, books and a scarab. The game logo pays out the highest amount. If you hit 5 symbols consecutively, you’re rewarded 500x your stake. Wild symbol- The wild symbol appears anywhere on the screen and can replace other normal symbols. They can also form their own wins. If you land 2 or more of them in a row, you can end up winning the same rewards you’d get when forming a win line with the game logos. Bonus symbols- If you land 3 bonus symbols anywhere on the reels, a map is revealed. Players will roll the dice and hope to find their way to 1 of 3 different special features within the machine. The first of the features is a free spins game. It starts off with a wheel mini game which shows you how many spins you get, any multipliers rewarded and also if any of the low paying symbols are to be replaced by wilds. 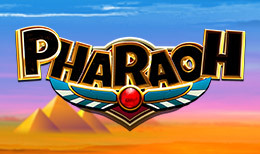 Pharaoh Wild Spins- Here you get to play 4 free spins. On each of the spins, 2 more wilds can be added onto the reels. Pyramid of Prizes- Here punters play a pick ‘em styled game where bigger and bigger rewards are collected as you go higher up the steps. If you get to the top without activating the end of the feature, you’re move onto the free spins rounds as an extra bonus. Fortune Bet- Activating the fortune bet feature ups the cost of each play by 50%. This transforms any bonus symbols into double height symbols. This increases the chances of you hitting them and also there’s a better likelihood that you’ll trigger the special features. Inspired Gaming has made an effort to add some flavour to an already exhausted theme. If you’re not a fan of the Egyptian theme, chances are you’re still going to love this because the developers aren’t shoving too much of it in your face.